Mark wanted to give Laura something really special on their wedding day and liked the idea of it being inspired by her vintage engagement ring.Laura's birthstone is tanzanite so we used a 2.5mm brilliant cut stone in the centre and Mark's is sapphire, so we placed seven 1.5mm pink sapphires around it. The settings have all been grained to further echo the design of the ring. 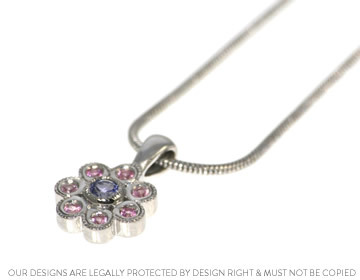 We made the pendant in rhodium plated 9ct white gold to contrast with the pretty pinks and blues, and hung it on a simple 16" baby snake chain.